Augsburg is getting ready to celebrate the accomplishments of its 860 students in the Class of 2008 who are eligible to graduate this year at two Commencement Ceremonies—Saturday, May 3, and Sunday, June 29. On May 3, 364 Day College students and 26 physician assistant studies students cross campus for the last time as Augsburg students, marching to Melby Hall through two long lines of faculty, who are cheering them on and giving out well-deserved high-fives and hugs. For the weekday students it’s a different scene than the one they remember on that day in September when they marched as a class for the first time, to the Opening Ceremony, timidly, through faculty welcoming them to college. a cultural anthropologist at Macalester College, who became a best-selling author with his book Genghis Khan and the Making of the Modern World, with research that took him to Mongolia a number of times over the past several years. His scholarship focuses on how tribal peoples around the world relate to the larger societies surrounding them, which he has applied to cultures as disparate as coca growers in Bolivia, American Indians in the U.S., and politicians on Capitol Hill. He has written numerous articles and several books, and has appeared on such popular news and feature shows as the Today show, ABC Evening News with Peter Jennings, All Things Considered, and Nightwatch. Professor Weatherford will receive an honorary degree from Augsburg College, Doctor of Humane Letters, for his teaching that encourages students to use their skills in anthropology to understand relationships in the world around them and to help them prepare for the challenges of global citizenship. 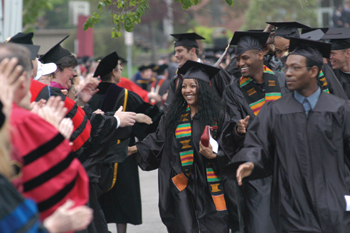 For information and schedules for the two Commencement weekends, go to www.augsburg.edu/commencement.